At some point, almost all real estate investors look into acquiring tax sale properties as a way to expand their business or branch into a new area of real estate. There is a lot of misinformation which leads investors to believe that tax sale properties are readily available for pennies on the dollar, free and clear. Unfortunately, this is simply not true. The shame is that after attending a few auctions or buying a few liens, most investors are disgruntled to find that they are not acquiring properties with the ease they had expected. Or they’re paying much more than they expected. 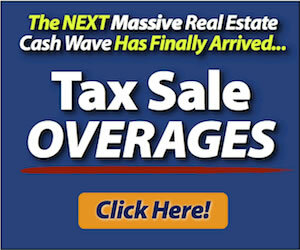 -Tax sale properties are offered with a competitive bidding system, and the prices are bid to near market value. Good tax sale properties sell for much, much more than the minimum bid and far from “pennies on the dollar”. -Tax liens take months and months, or even years, to lead to a property acquisition. Most tax liens pay off, leaving the investor with a relatively small amount of interest compared to the effort he put into participating in the sale. -Tax liens require attorneys at several different stages, which adds a significant expense to the equation. So, attending a public sale to get tax sale properties is not the way to go. 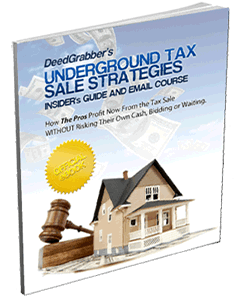 It turns out however, that with a small shift in your thinking, you’ll see that there is actually an unending source of tax sale properties that are free and clear. These too are available for pennies on the dollar, and require no legal work. Go straight to the source: the owner who is about to lose the property. Get an upcoming tax deed sale list, or request a list of liens that were sold in the past and are nearing their redemption period. Then you can contact those owners who are right on the cusp of losing their property. You’ll find that many of these owners have inherited the property, or simply don’t want it. That’s why they haven’t paid the taxes. You’ll also find that most of these properties are free and clear. Lenders usually redeem properties that are nearing a tax sale so they don’t lose their mortgage interest. The properties that remain are usually there because there is nobody but the uncaring owner to redeem. You care though. You know you can pick these properties up all the time for a token payment to the owner (or get them under contract and flip them to an investor), and make thousands or even tens of thousands per transaction. Get my free guide (below) now! With tax sale properties nearing deed sale or the end of their redemption period almost every day, the source of properties for you to pursue is almost endless. Looking for information to get started. That is all, no need for further communication. Just enter your name in the optin box for more info! « County Tax Liens: A Good Way to Acquire Cheap Property?